Though it has many uses and benefits, Styrofoam, a brand name for polystyrene foam, takes a hefty toll on the environment. Estimates vary for the breakdown of Styrofoam from a few years to as much as 1 million, depending on environmental conditions. Because of the harm this solid waste causes to the environment, many places have banned the petroleum-based material, including Orange County in California and the city of Portland, Oregon. In Styrofoam, atoms are bonded to one another strongly, making it very stable. Because of this stability, the plastic repels water, and resists acids, bases, salts and other corrosive substances. It is non-toxic. It has a long shelf life, making it convenient and cost-effective for businesses. It doesn't grow mold or bacteria, so it stays sanitary in storage, and helps keep food safe. The downside to Styrofoam's chemical stability is, once in the environment, it can remain for generations. Although it resists most chemicals, Styrofoam is sensitive to sunlight in a process called photodegradation, or "breakdown by light." Over months, continual exposure to sunlight affects the outer layer of the plastic, discoloring it and turning it into a powdery substance. Because of this action, thin styrofoam packaging can break down in a few years. Inside a landfill and shielded from light, however, no such breakdown takes place. In addition to photodegradation, a process called leaching can occur when the plastic becomes excessively hot. Under these conditions, tiny amounts of styrene can seep out of the plastic and contaminate anything packaged in it. Styrofoam is commonly used in disposable products that are only used once. These products can persist in the environment for more than a million years, however, since polystyrene is not biodegradable. Though it is slow to break down chemically, Styrofoam does however fragment into small pieces, choking animals that ingest it, clogging their digestive systems. Styrofoam and other plastics currently make up about 30 percent of the landfill volume in the United States. 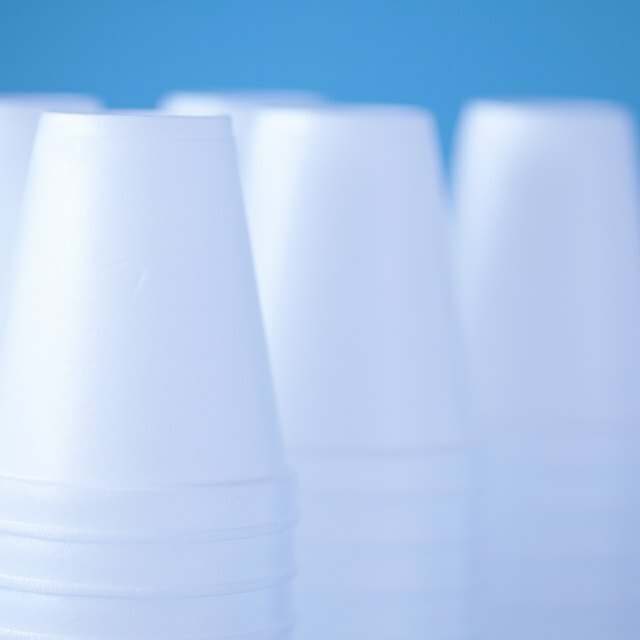 Some restaurants and food vendors have substituted cardboard and paper products for Styrofoam in cups, fast-food "clamshells" and other food packaging. Especially in the presence of moisture, paper fibers break down within weeks to months. Biodegradable alternatives such as "soapstock waste" from agricultural operations can replace Styrofoam for protecting packages, and recycled paper can be used for cups, eliminating some Styrofoam waste. Roman, Max. "How Long Does it Take for Styrofoam to Break Down?" Sciencing, https://sciencing.com/long-styrofoam-break-down-5407877.html. 19 April 2018.